What is the best on page seo tool that can check the metrics for the top 10 natural results for a given kw? Actually, now that I've photoshopped out the details I noticed it didn't pull in any of the on-page stuff like it was supposed to. I ran a few other queries and it was pretty spotty. And you can see some of the other metrics are off, like Index Count. Maybe had they gone the subscription route back in the day they'd be on top of these fixes better. Back to the drawing board. One less vote for Market Samurai. Depends on what metrics you care about... But on the whole the best out there is still Ahrefs (which is a shame). Ahrefs is great in many ways, but they're far from being amazingly accurate. They've been slipping recently too imho. I still use them for Domain Rating, Referring Domains and Backlinks. At least when it comes to SERP analysis. Keyword Difficulty is amazingly inaccurate. I wrote in my journal about collating data from 500 SERPs top 20 results. Part of this analysis was done with Ahrefs. Both to study the SERPs themselves and also get an idea of what I should actually be paying attention to in Ahrefs since it's one of my cornerstone tools. - Of every site tested (top 20 of every SERP) the average Domain Rating was 77.6333. - Of every SERP tested the Keyword Difficulty Average was 18.7. Using some other metrics available on Ahrefs, a few key pieces of scraped data I was able to create a much more realistic competitiveness and difficulty score. Ryuzaki you can get similar on-page specs from Keysearch's KD tool. May be worth a test...? They use meta-description as an indicator of difficulty? On page metrics as in - kw density of the top 10 results, h tags, title tags etc. Title, meta description and URL. It's missing heading tags. Yeah this is what I'd prefer to see - but of the top 3 results. Word count too. Difficult to do automatically though as large amounts of header/footer text can affect this information. You can use the free version of Website Auditor to do on page checks with comparisons against the SERPs for the target keyword vs your page. I am using it at the moment to improve my content with TF*IDF analysis too. 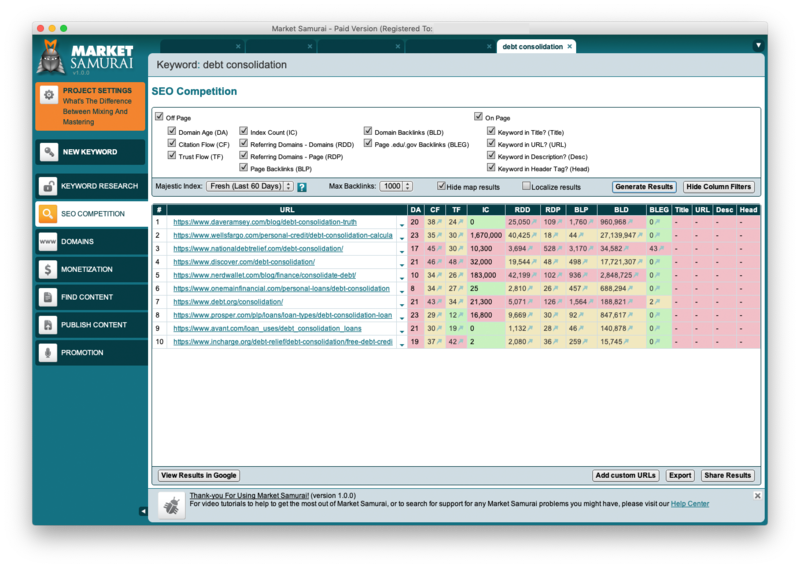 Another option for onpage seo stuff would be Page Optimizer Pro, really good stuff. The two best On Page SEO Tools, IMO, are Cora and Page Optimizer Pro (mentioned above). Cora is like POP (Page Optimizer Pro) on steroids... it crawls the top 100 results for a keyword and measures your site against them based on over 500 ranking factors. Then gives you suggestions based on your deficiencies... so you can just tweak the page and see if there was an improvement. I've been using it for almost a year and see really great results from it. Is it legit - their site looks sketchy af.